The Lakeside 815 WAL metal bus has four reinforced shelves made of 20-gauge stainless steel, accommodating heavy loads up to 500 pounds. The top shelf has three ledges to secure items, while one edge is angled down to make loading and unloading heavy product simple. The three lower shelves are enclosed on three sides to prevent contamination and prevent items from falling off. Each shelf measures 24 inches long by 151⁄2 inches wide with a 9-inch clearance, providing space for flatware tubs, dishes, trays, and more. 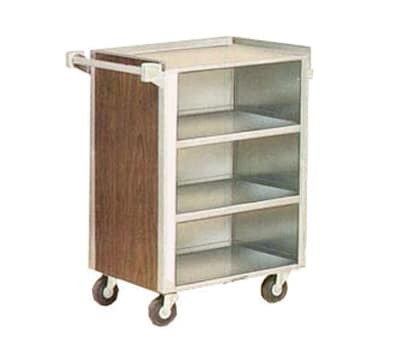 An all-welded leg construction makes the Lakeside 815 WAL metal bus cart durable and easy to clean. With its walnut finish on the vinyl exterior, the unit fits into most décors. The cart is mobile thanks to four 4-inch casters that swivel for maneuverability, and the push handle makes steering around obstacles simple. 4 shelves hold up to 500 lbs.